You may find the allowable ampacity for underground cable configurations by taking the time to look up the tables and diagrams of the Canadian Electrical Code. 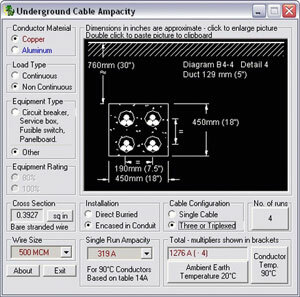 Using this underground cable ampacity calculator you will be done in a minute. It will save you hours in a year, and most importantly it will reduce the chance of making an error. Determine required feeder gauge for given configuration very fast. Quickly apply required correction factors. Paste the selected feeder configuration diagram to any application. Select feeder parameters in any sequence you like. Has built in wire cross-section data and minimum duct size information. Does not require manual. Just select options and values. I am in need of a program to assist in transmission line caclulations. It needs to provide sag, wind loading, ice loading pole class, tension etc. Hopefully freeware. Can you assist.